Pakistani media baffling U-19 World Cup by mystifications over the Pakistani team with a bad omen. Young Indian team displaying their zeal and class under the coach ship of veteran batsman Rahul Dravid made the whole cricket fraternity proud by beating India’s all-time rival Australia in the Finals. Before advancing into final India defeated Pakistan by crushing them to restrict merely to the score for 59 held at Hagley Oval, Christchurch, New Zealand. Lots of hype and ecstasy was created by the Pakistani manager Nadeem Khan by boasting about their team prior to the match between the two rivalries. 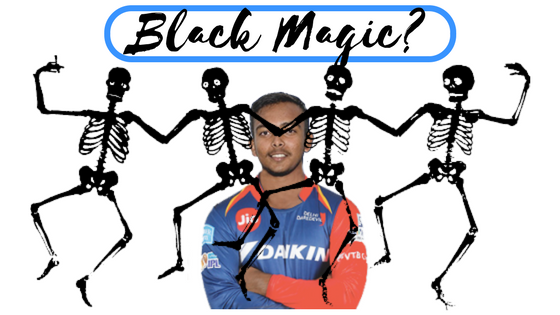 To cover up their flaws and incompetency Pakistani manger while returning back to Karachi he claimed during the match their whole team was under the spell of black magic. Adding on to his hilarious statement he also said his young team during the match couldn’t figure it what is happening and they complain as if their mind is being captivated on the field. Pointing towards the on-field which they found quite magically ominous inbounded which made their mental capability insufficient to handle pressure. In fact former Test Cricketer, Nadeem also said about the stature in their eyes for Rahul Dravid and about his goodwill gesture by coming down to their dressing room after the semi-final. Earlier his claim of Dravid coming to their dressing room already bring falsified when veteran batsman clarified the whole scenario of post-match of the semi-final. Pakistani media drawing inferences, taken the whole world into laughter when they started to show how the spell was cast on the ball by Indian team when Pakistan were 24 for 3. Not only this they are also showing some past videos of matches when Dravid scored centuries on tour to Pakistan and linked each of them how The Wall deployed some dark tactics. In fact, some of the former Pakistani players are also spreading misnomer about their bad performances due to bad omen that happened in the past. Cricket hitherto know as Gentlemen Game with lots of strategy and tactics putted on the line of scientific rationality might make many Pakistani citizens fall into orthodoxy. Already they are famous of breaking their Television sets into pieces after losing matches. It will be interesting to see how companies will be benefited from this. Thanks for your support. Will look into it.